MONTRÉAL, QUÉBEC--(Marketwired - June 4, 2013) - Quebecor Media and the Société de transport de Montréal (STM) are proud to announce a world's first in street furniture that will benefit all Montrealers and visitors to the city: 84-inch (2.1-metre) interactive digital transit shelters featuring gesture recognition. The new state-of-the-art shelters will bolster Quebecor Media's positioning as the market leader, enhance the commuter experience for STM clients, and help advertisers reach their target audiences more effectively. "Building on our culture of innovation and our strong relationship with Quebecers, these digital bus shelters, which will be installed across the Island of Montréal, are certain to please users of mass transit, visitors and advertisers alike," said Robert Dépatie, President and CEO of Quebecor Media. "The powerful, user-friendly technological platform we have created will also unable us to upgrade the product over time and steadily improve the fixtures seen on Montréal streets." "This long-term agreement is the result of a rigorous call for expressions of interest process," said Michel Labrecque, Chairman of the Board of the STM. "We will draw on Quebecor's energy, dynamism and capacity for innovation to replace our transit shelters, keep them clean and in good condition, keep commuters better informed and increase our non-fare revenues. We are very pleased with this business partnership, which has been established in collaboration with our commercial arm, Transgesco, and we welcome Quebecor's socially responsible commitment to mass transit and to our clients." 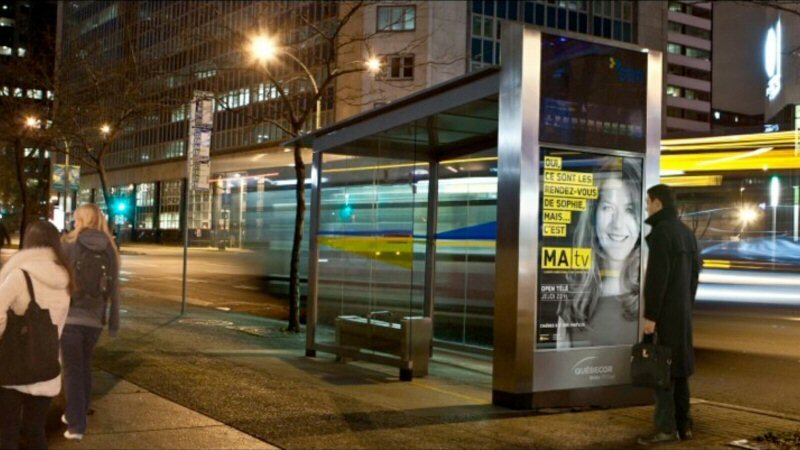 In September 2013, Quebecor Media will install some 40 digital shelters, custom designed by and for Quebecers, across the Island of Montréal. STM users and all Montrealers will be able to consult bus schedules, see a detailed map of the bus and metro system, catch up on the latest news and see the weather forecast. The public will also benefit from the infinite creative possibilities that these interactive vehicles will open up for advertisers. Capabilities such as the ability to interact close-up with customers in their environment, to screen videos, to offer discounts or to sell concert tickets make the digital transit shelter a major innovation. In addition to pushing the bus shelter envelope, Quebecor Media has undertaken to add 850 transit shelters to the existing network and to replace all of the approximately 1,870 shelters under its responsibility by 2023. During the current year, Quebecor Media will install 200 transit shelters in all parts of the city, including 40 digital shelters. The complete design, developed by the Leblanc + Turcotte + Spooner consortium, winners of a contest organized by Design Montréal, strikingly reflects Montréal's identity. In keeping with Quebecor Media's focus on offering both users and advertisers the best product, the shelters will be maintained in accordance with the highest industry standards, resulting in more beautiful city streets. In mid-July, Quebecor Media will launch the Clean + program: commuters will be able to report a shelter in need of special attention by dialling 514-227-4287 (514-ABRIBUS) and the situation will be assessed within 48 hours. The program will contribute to improving the look and cleanliness of Montréal's street furniture. Quebecor Media was selected following an invitation to tender to install, maintain and advertise on Société de transport de Montréal (STM) bus shelters for the next 20 years. It is a major move by Quebecor Media into a line of business that is experiencing significant technological change. For more information about the new bus shelters, visit http://abribus.ca. Quebecor Media Inc. is a subsidiary of Quebecor Inc. (TSX:QBR.A)(TSX:QBR.B), one of Canada's largest holding companies operating in the telecommunications and media businesses. With more than 16,000 employees, Quebecor Media Inc., through its subsidiary Videotron Ltd., is an integrated communications company engaged in cable television, interactive multimedia development, Internet access services, cable telephony and mobile telephony. Through Sun Media Corporation, Quebecor Media Inc. is the largest publisher of newspapers in Canada. It also operates Canoe.ca and its network of English- and French-language Internet properties in Canada. In the broadcasting segment, Quebecor Media Inc. operates, through TVA Group Inc., the number one French language conventional television network in Québec, a number of specialty channels and, through Sun Media Corporation, the English-language SUN News channel. Another subsidiary of Quebecor Media Inc., Nurun Inc., is a major interactive technologies and communications agency with offices in Canada, the United States, Europe and Asia. Quebecor Media Inc. is also active in magazine publishing (Publications TVA Inc.), book publishing and distribution (Sogides Group Inc., CEC Publishing Inc.), the production, distribution and retailing of cultural products (Archambault Group Inc., TVA Films), video game development (BlooBuzz Inc.), DVD, Blu-ray disc and videogame rental and retailing (Le SuperClub Vidéotron ltée), the printing and distribution of community newspapers and flyers (Quebecor Media Printing Inc., Quebecor Media Network Inc.), outdoor advertising (Quebecor Media Out of Home), news content production and distribution (QMI Agency), and multiplatform advertising solutions (Quebecor Media Sales). 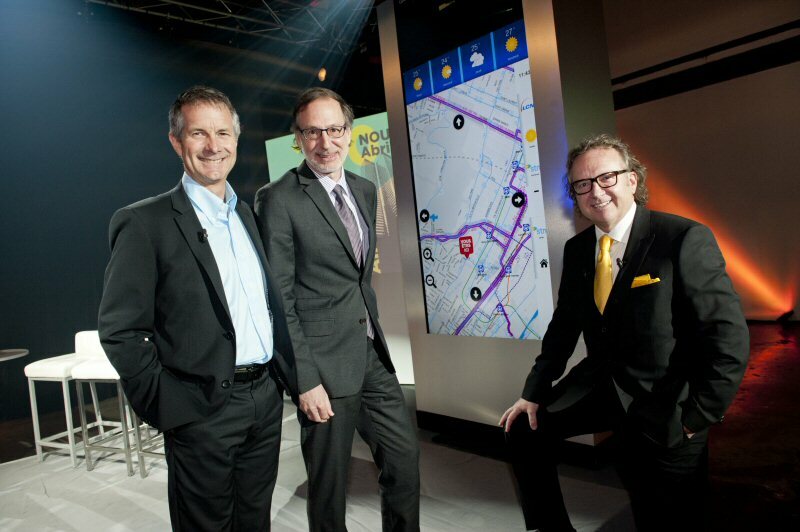 Claude Foisy, Vice President of Quebecor Media Out of Home, Michel Labrecque, Chairman of the Board of the Société de transport de Montréal and Robert Dépatie, President and CEO of Quebecor Media at the press conference which revealed the details of an innovative new display network. Quebecor Media reveals the details of an innovative new display network.